This quilt started with an Appliqued centre block from a Cathy Van Bruggen pattern. I then used it as a Challenge with Sew Creative adding borders around the block in a defined order, each additional border had to be separated by a plain border. Afgeppab stands for Applique, Flying Geese, English Paper Piecing, Applique and Borders. My Centre block was a bit too large to fit the outside borders despite me measuring lots!!!!!!!! So after I had spent six hours just SID all the pieces I cam back to the centre. Filtec Essence thread, Magna Glide bobbins, machine light switched off, Glide on. The butterfly is 1 1/4". Before and after photos. Sorry about the sideways shot! 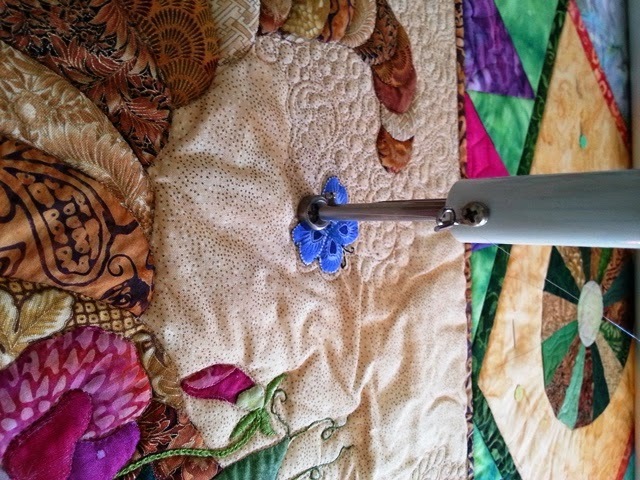 Nice quilting, ....... what is the Filtec Essence thread??? Essence is Filtec's version of a clear monofilament thread. In my shop 1375m for $6.60. This is my first quilt testing it out and I love it more than Monopoly. What pretty fill work! 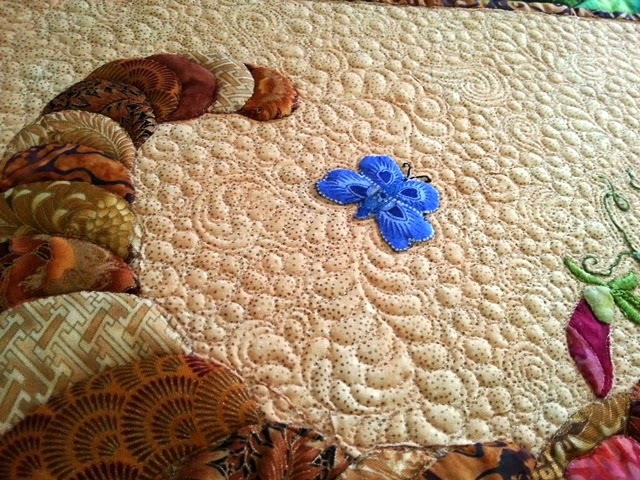 The fullness quilted out so nicely - almost like it needed the extra bit, eh? Love the dimension of the cornucopia, is it? What batting did you use on this? Was it trapunto'd? I use a wool poly batting, It isn't trapuntoed because of the dense fill around it, the cornucopia "pops" because it only has minimal quilting on it.